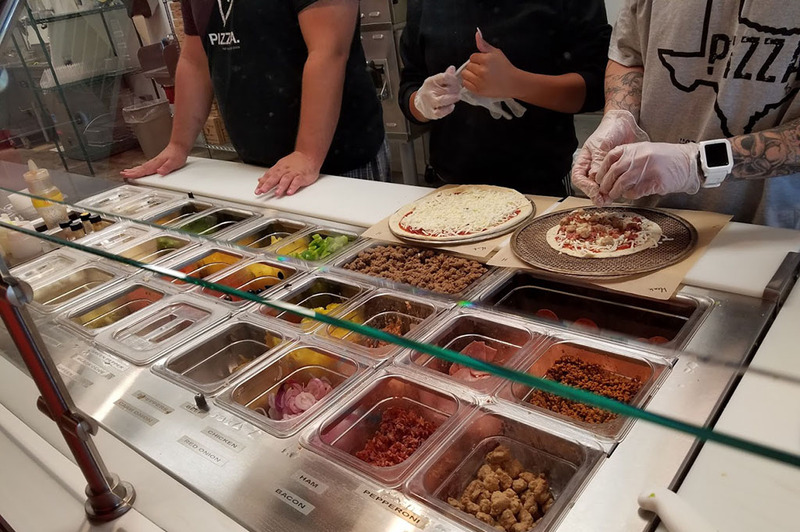 It seems that the Subway/Chipotle assembly line method of fresh cooked food has become the current thing in fast casual restaurants—especially pizza! To be sure, the assembly line approach is very time efficient. But when combined with fresh ingredients and a hot oven/grill/griddle, it can produce wonderful food including: sandwiches, burritos, burgers, or in this case pizza. Houston has had four different assembly line flash bake pizza joints open in the past couple of years. However, Hot Toppings is THE only one locally that stands out from the others. 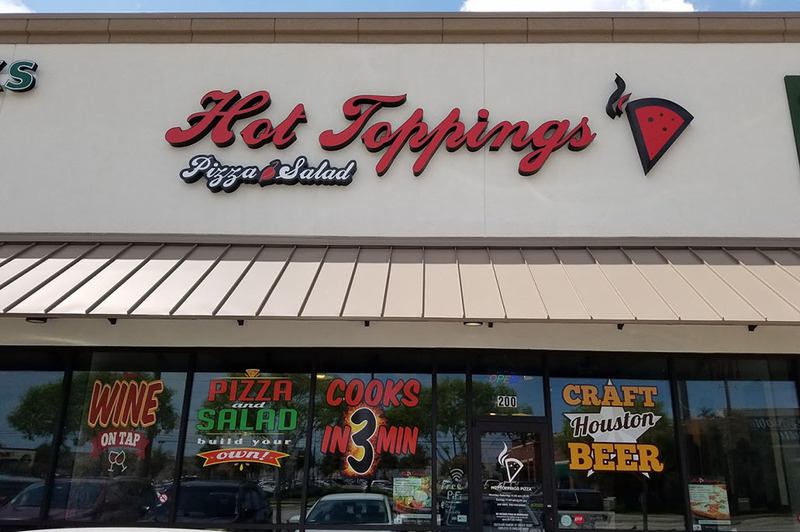 The first thing to note about Hot Toppings is that their location is in the nexus of Westheimer, Hillcroft and Voss and is easily accessible to folks from all over West and Southwest Houston. The staff are very friendly and will walk you through the assembly process step by step. 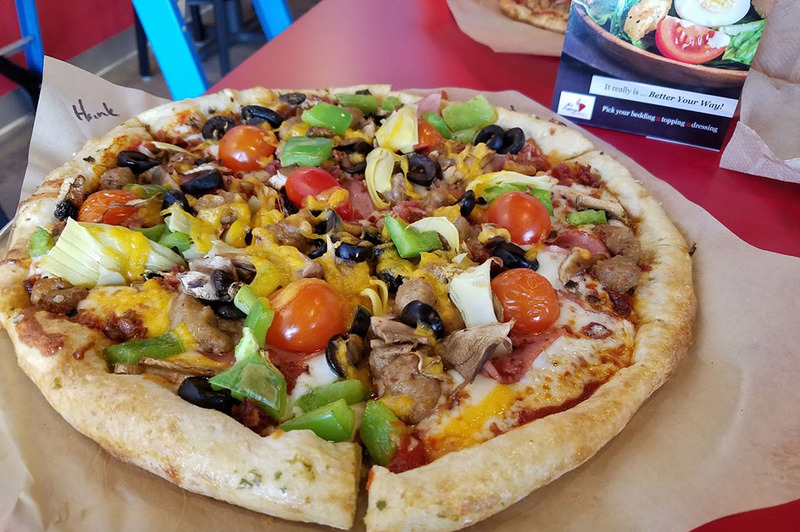 Here you get a choice of a personal 6” or 10” pizza with… UNLIMITED TOPPINGS. You heard that right—UNLIMITED! While that might tempt some folks to overload their pies, pizza lovers know that it’s not necessary. The staff will guide you as well. They have a great selection of fresh meats: bacon, ham, pepperoni, Italian sausage, chorizo, beef meatballs, and BACON. They have a few different sauces to choose from including white, marinara or olive oil. They also have a nice array of fresh fruits and vegetables. Although Poppy from Seinfeld would throw a fit if you put cucumbers or lettuce on a pizza, they can and will do it. In fact, any of their pizzas could be prepared as a salad or vice versa. Talk about flexibility!!! I would also be remiss if I did not mention that they have a great selection of rotating local craft beers on tap as well as bottles.They also have some good table wines by the glass as well as wine on tap. This is a great way to enjoy wine in a way that more environmentally sustainable. Of course all of these selections would mean nothing if the pizza wasn’t delicious! But, I am happy to report that the crust is perfectly cooked. I.e. thin crust, a little crispy outside, and chewy inside and in the center. 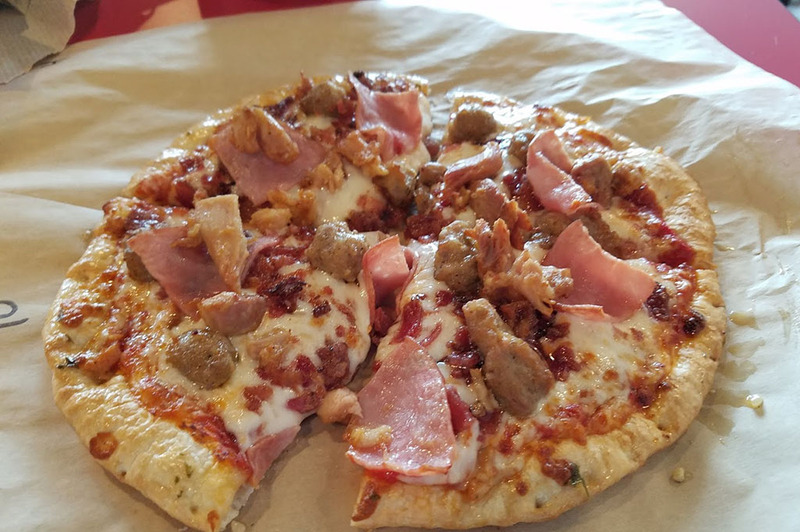 My son Jason always gets his “Meat Treat” which is a nice crust with marinara sauce, bacon, ham, Italian sausage, chicken, mozzarella, and cheddar. My daughter Helena orders what she calls an “Ultiveg”: mushrooms, garlic, basil, pineapple, cucumbers, sundried tomatoes, and artichoke hearts. Sometimes she orders it with a little ham or bacon, but always on white sauce. As for me, I prefer a pizza with everything—marinara sauce, ham, bacon, Italian sausage, black olives, mushrooms, green peppers, artichoke hearts, sundried tomatoes, and a ton of mozzarella and cheddar. As for yours truly, I found the marinara sauce to be tangy; the crust to be strong enough to hold it all together; and the meats and veggies fresh and full of robust flavor. This is a very enjoyable pizza to enjoy with an ice cold craft beer or Dr. Pepper. The pizza is great cold or reheated in the toaster oven the next day. The true mark of a great pizza!